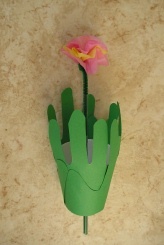 This growing flower kids craft is a great way to celebrate spring time. This craft is made from a paper cup, straw, pipe cleaner, construction paper and tissue paper, an easy and inexpensive craft! Just move the straw up and down and watch your flower grow! 2. With a pencil, poke a hole into the bottom of the cup. Insert the pipe cleaner into the straw, and then insert the straw into the hole in the cup. This makes the stem of the flower. 3. Cut out 3 or more circles out of the tissue paper (use a small mug as a template). Poke the pipe cleaner into the center of each piece of tissue paper and then curl the pipe cleaner to secure the paper. 4. Fold the tissue paper up and wrap the pipe cleaner around the bottom of the flower to secure it in place. Move the straw up and down to watch the flower grow out of the grass!